How can you do SEO yourself? Your website review is the first step. But wait..I don’t even know what it means to analyze a website! If you’re a newbie to all this, don’t fear! We developed MarketGoo for users just like you. What is a website analysis in SEO? SEO stands for ‘search engine optimization’. An SEO website analysis refers to an audit of how search-engine friendly your website is – will search engines like Google and Bing be able to find your website, and is it likely that you will appear in the first pages of search results? You can get this information from an SEO website analysis. Generally, your site will be assigned a score and errors will be highlighted. If your site is well optimized for SEO, then your analysis will provide few errors and a high score. You may also receive specific recommendations to improve your score. In an effort to audit your site and determine where you can improve, you may resort to a variety of online tools to evaluate each aspect of your website. While this method may ultimately give you valuable data, it is neither efficient or simple to do and there is an easier way, with MarketGoo. How does it work in MarketGoo? MarketGoo offers a comprehensive website analysis by presenting you with an SEO report containing various sections. The first one of these sections goes over your site’s major technical errors, and then goes even further and provides you with small but important changes you can make to improve performance, as well as larger, more technical changes that will also have an impact on your traffic and rankings. Here you will see how elements such as your site’s size, speed and technical errors contribute to your visitors’ experience. Our systems will monitor your website every 24 hours with MarketGoo Pro, and weekly with MarketGoo Lite (our totally free SEO tool), looking for warnings and checking the technical health of your website. 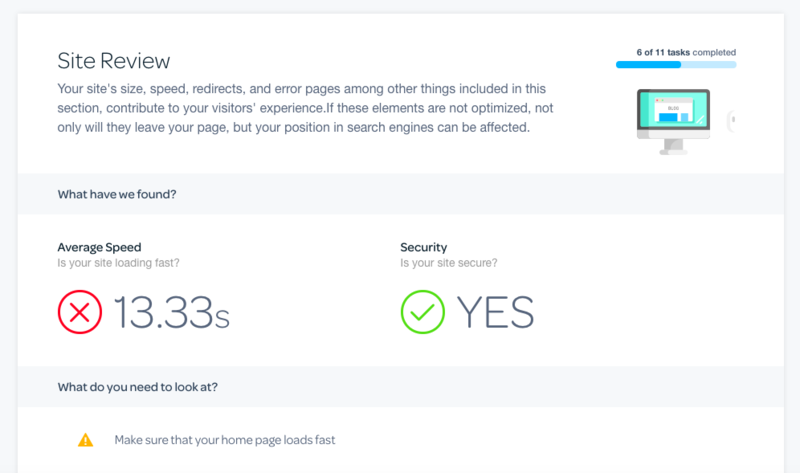 As you complete each of the tasks related to this section, we will explain why these elements are important, and continually remind you of actions you can take to improve your visitors’ experience.